The image of “small paper lanterns” from the song God of the Bible captured my imagination immediately during Sunday morning worship this week. Not that I hadn’t sung that line many times before, both at Kern Road and in my former congregation, but this time I found the phrase riveting, couched as it was in words about changing world order. Imagine my surprise then, when Pastor Janice repeated those words first thing in her sermon…and my further delight, later in the service, when Deanna called attention to the paper lantern image one more time as she led us in our morning congregational prayer. Janice told a moving story during her sermon about a local pastor friend who was born and raised in Syracuse, NY, in what the friend considered a well-integrated neighborhood. This summer Janice’s friend unexpectedly met another pastor raised in the same neighborhood, whose parents were the first African Americans to move there some 20 years before Janice’s friend’s family arrived. The neighborhood struggled with integration issues upon arrival of the African American family, but, until these two women met this summer, it seemed the African American pastor did not realize the fruits of her parents’ struggles. She was one of the fortunate ones who learned, long after the fact, that changes did, indeed, take place in the neighborhood, though at a steep price for her parents and probably other families like hers. “God does God’s work in God’s slow and steady way…it’s out of our hands,” Janice suggested. “Many times the ones who plant the seeds may never know how God has made those seeds grow,” she added. My mind traveled back to the image of the small paper lanterns and some of the people who have lit the way for me. Unfortunately, the male pastors in the congregation of my growing up years did not inspire me with their warnings about skirt and hair lengths, but I do recall Sally, the reassuring teacher who welcomed all of us children to our first year of Sunday school. Cora kept us well supplied with intriguing library books, and Marilyn sang beautifully…they were all inspirations in their own way, each contributing something to my young, impressionable life. Aunt Beth, editor of the Words of Cheer, published during my childhood by Herald Press, made me want to be a writer. 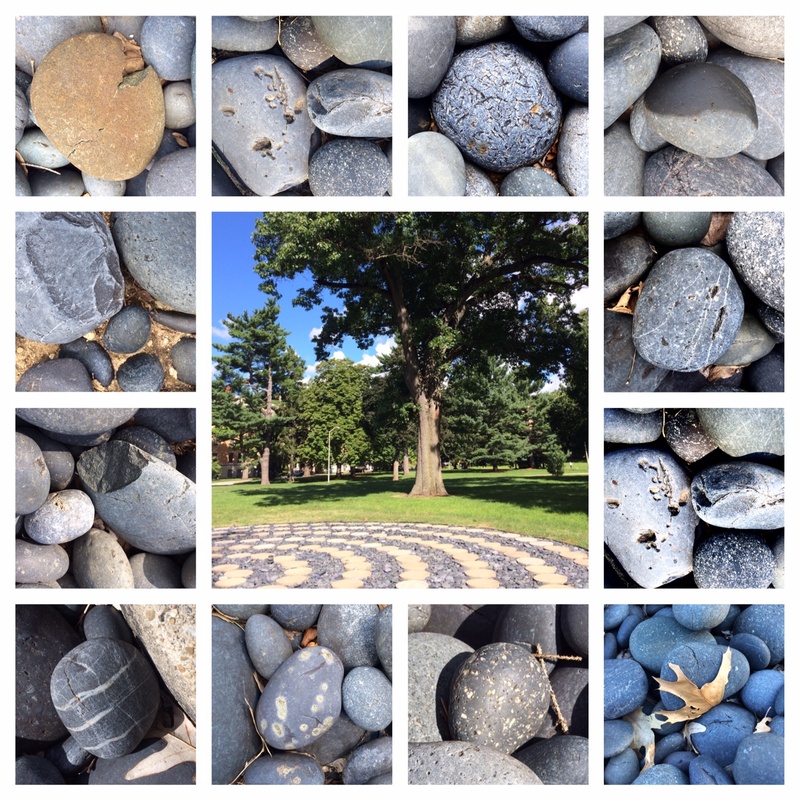 I walked the Saint Mary’s labyrinth (pictured above) with two high school friends this past week as we embraced 70 and pondered the future for what’s next. I didn’t think a whole lot then about how I might engage with the youth of our congregation, but, after Pastor Lane’s formation hour challenge on Sunday, I’m considering more seriously how I might be a small paper lantern for younger generations, even as they shine their lights back at me. As an active grandparent to four children 11 and under, I have engaged with the younger set in lots of ways…taking them to ballet, soccer, choir, drama class, swimming, story time, gymnastics; for chest Xrays and other medical or dental appointments, to haircuts, book fairs, museums, libraries. We’ve done breakfast, lunch, and dinner, visited countless ice cream parlors and coffee shops. We know the aisles of Target and Costco and Meijer quite well, and have made applesauce and pancakes together, picked blueberries, ridden carousels, recycled aluminum cans, stopped for the family farm share, visited pumpkin and Christmas tree farms, and attempted simple sewing projects. So how might all that experience translate into involvement with younger generations at Kern Road? I’m still sorting that out and am eager to hear how other KRMCers find ways to interact with our youth. Our formation hour conversation reminded me that about 20 years ago, long before I was thinking about grandchildren, I began relating to two 10-year-olds in my former congregation (without benefit of a church program). New pastors had just arrived in town with three children who knew none of us, so I took it upon myself to help build a friendship between that family’s 10-year-old daughter and another 10-year-old girl in the congregation. I remember visiting museums and playing together in the snow at a nearby elementary school, and realize now that those two young women helped prepare me to become an involved grandmother…at that stage of my life, they were two of my small paper lanterns! Who has been a small paper lantern for you? For whom have you functioned in that capacity? As we seek to become lanterns for each other and notice the light of other lanterns shining in our midst, “may we trust in the slow and steady work of God among us,” Janice reminded us in the closing words of her sermon. Another reason I have loved the image of paper lanterns has much to do with this Grand Rapids Art Prize entry back in 2012!